Our company classifies any order that is placed by a client and has a deadline of less than six hours as very urgent. We go through the specifications of all the orders that we receive on a daily basis and once your order has been certified as very urgent, we shall give it the priority that is rightfully due to it. 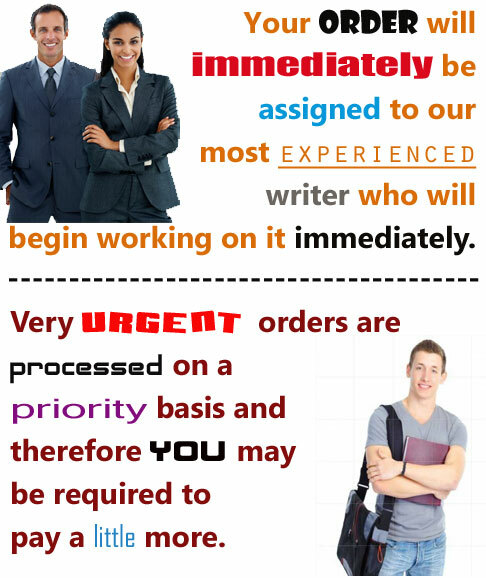 Your order will immediately be assigned to our most experienced writer who will begin working on it immediately. Due to the urgency of the order we always advise that the client stays online for the better part of the writing period so as to be available to the writer incase he needs some clarification on any issue. Very urgent orders are processed on a priority basis and therefore you may be required to pay a little more. Our writers are classified on the basis of their qualifications and therefore very urgent orders will be assigned to one of the top ten writers in our company. Our prices page will show you that our prices are arrived at on the basis of the urgency of the order. The prices indicated have factored in the urgency of the order and thus making the ordering process very easy.